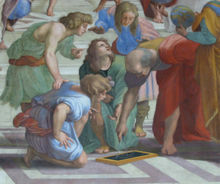 Euclid, Greek mathematician, 3rd century BC, known today as the father of geometry; shown here in a detail of The School of Athens by Raphael. Mathematics ( colloquially, maths, or math in American English) is the body of knowledge centered on concepts such as quantity, structure, space, and change, and the academic discipline which studies them; Benjamin Peirce called it "the science that draws necessary conclusions". It evolved, through the use of abstraction and logical reasoning, from counting, calculation, measurement, and the study of the shapes and motions of physical objects. Mathematicians explore such concepts, aiming to formulate new conjectures and establish their truth by rigorous deduction from appropriately chosen axioms and definitions. Knowledge and use of basic mathematics have always been an inherent and integral part of individual and group life. Refinements of the basic ideas are visible in ancient mathematical texts originating in ancient Egypt, Mesopotamia, Ancient India, and Ancient China, with increased rigour later introduced by the ancient Greeks. From this point on, the development continued in short bursts until the Renaissance period of the 16th century where mathematical innovations interacted with new scientific discoveries leading to an acceleration in understanding that continues to the present day. Today, mathematics is used throughout the world in many fields, including science, engineering, medicine and economics. The application of mathematics to such fields, often dubbed applied mathematics, inspires and makes use of new mathematical discoveries and has sometimes led to the development of entirely new disciplines. Mathematicians also engage in pure mathematics for its own sake without having any practical application in mind, although applications for what begins as pure mathematics are often discovered later. The word "mathematics" (Greek: μαθηματικά) comes from the Greek μάθημα (máthēma), which means learning, study, science, and additionally came to have the narrower and more technical meaning "mathematical study", even in Classical times. Its adjective is μαθηματικός (mathēmatikós), related to learning, or studious, which likewise further came to mean mathematical. In particular, μαθηματικὴ τέχνη (mathēmatikḗ tékhnē), in Latin ars mathematica, meant the mathematical art. The apparent plural form in English, like the French plural form les mathématiques (and the less commonly used singular derivative la mathématique), goes back to the Latin neuter plural mathematica ( Cicero), based on the Greek plural τα μαθηματικά (ta mathēmatiká), used by Aristotle, and meaning roughly "all things mathematical". Despite the form and etymology, the word mathematics, like the names of arts and sciences in general, is used as a singular mass noun in English today. The colloquial English-language shortened forms perpetuate this singular/plural idiosyncrasy, as the word is shortened to math in North American English, while it is maths elsewhere (including Britain, Ireland, Australia and other Commonwealth countries). The evolution of mathematics might be seen to be an ever-increasing series of abstractions, or alternatively an expansion of subject matter. The first abstraction was probably that of numbers. The realization that two apples and two oranges have something in common was a breakthrough in human thought. In addition to recognizing how to count physical objects, prehistoric peoples also recognized how to count abstract quantities, like time — days, seasons, years. Arithmetic ( addition, subtraction, multiplication and division), naturally followed. Monolithic monuments testify to knowledge of geometry. Mathematics arises wherever there are difficult problems that involve quantity, structure, space, or change. At first these were found in commerce, land measurement and later astronomy; nowadays, all sciences suggest problems studied by mathematicians, and many problems arise within mathematics itself. Newton was one of the infinitesimal calculus inventors, Feynman invented the Feynman path integral using a combination of reasoning and physical insight, and today's string theory also inspires new mathematics. Some mathematics is only relevant in the area that inspired it, and is applied to solve further problems in that area. But often mathematics inspired by one area proves useful in many areas, and joins the general stock of mathematical concepts. The remarkable fact that even the "purest" mathematics often turns out to have practical applications is what Eugene Wigner has called " the unreasonable effectiveness of mathematics." In modern notation, simple expressions can describe complex concepts. This image is generated by a single equation. Most of the mathematical notation we use today was not invented until the 16th century. Before that, mathematics was written out in words, a painstaking process that limited mathematical discovery. Modern notation makes mathematics much easier for the professional, but beginners often find it daunting. It is extremely compressed: a few symbols contain a great deal of information. Like musical notation, modern mathematical notation has a strict syntax and encodes information that would be difficult to write in any other way. Mathematical language also is hard for beginners. Words such as or and only have more precise meanings than in everyday speech. Also confusing to beginners, words such as open and field have been given specialized mathematical meanings. Mathematical jargon includes technical terms such as homeomorphism and integrable. It was said that Henri Poincaré was only elected to the Académie française so that he could tell them how to define automorphe in their dictionary. But there is a reason for special notation and technical jargon: mathematics requires more precision than everyday speech. Mathematicians refer to this precision of language and logic as "rigor". Rigor is fundamentally a matter of mathematical proof. Mathematicians want their theorems to follow from axioms by means of systematic reasoning. This is to avoid mistaken " theorems", based on fallible intuitions, of which many instances have occurred in the history of the subject. 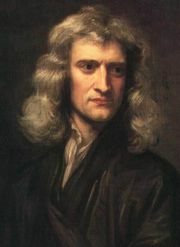 The level of rigor expected in mathematics has varied over time: the Greeks expected detailed arguments, but at the time of Isaac Newton the methods employed were less rigorous. Problems inherent in the definitions used by Newton would lead to a resurgence of careful analysis and formal proof in the 19th century. Today, mathematicians continue to argue among themselves about computer-assisted proofs. Since large computations are hard to verify, such proofs may not be sufficiently rigorous. 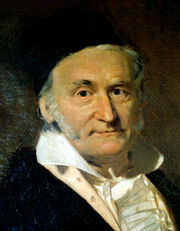 Carl Friedrich Gauss, while known as the "prince of mathematicians", did not believe that mathematics was worthy of study in its own right. Mathematical awards are generally kept separate from their equivalents in science. The most prestigious award in mathematics is the Fields Medal, established in 1936 and now awarded every 4 years. It is usually considered the equivalent of science's Nobel prize. Another major international award, the Abel Prize, was introduced in 2003. Both of these are awarded for a particular body of work, either innovation in a new area of mathematics or resolution of an outstanding problem in an established field. A famous list of 23 such open problems, called " Hilbert's problems", was compiled in 1900 by German mathematician David Hilbert. This list achieved great celebrity among mathematicians, and at least nine of the problems have now been solved. A new list of seven important problems, titled the " Millennium Prize Problems", was published in 2000. Solution of each of these problems carries a $1 million reward, and only one (the Riemann hypothesis) is duplicated in Hilbert's problems. Early mathematics was entirely concerned with the need to perform practical calculations, as reflected in this Chinese abacus. As the number system is further developed, the integers are recognised as a subset of the rational numbers ("fractions"). These, in turn, are contained within the real numbers, which are used to represent continuous quantities. Real numbers are generalised to complex numbers. These are the first steps of a hierarchy of numbers that goes on to include quarternions and octonions. Consideration of the natural numbers also leads to the transfinite numbers, which formalise the concept of counting to infinite. Another area of study is size, which leads to the cardinal numbers and then to another conception of infinity: the aleph numbers, which allow meaningful comparison of the size of infinitely large sets. The study of space originates with geometry - in particular, Euclidean geometry. Trigonometry combines space and number, and encompasses the well-known Pythagorean theorem. The modern study of space generalizes these ideas to include higher-dimensional geometry, non-Euclidean geometries (which play a central role in general relativity) and topology. Quantity and space both play a role in analytic geometry, differential geometry, and algebraic geometry. Within differential geometry are the concepts of fibre bundles and calculus on manifolds. Within algebraic geometry is the description of geometric objects as solution sets of polynomial equations, combining the concepts of quantity and space, and also the study of topological groups, which combine structure and space. Lie groups are used to study space, structure, and change. Topology in all its many ramifications may have been the greatest growth area in 20th century mathematics, and includes the long-standing Poincaré conjecture and the controversial four colour theorem, whose only proof, by computer, has never been verified by a human. In order to clarify the foundations of mathematics, the fields of mathematical logic and set theory were developed. Mathematical logic is concerned with setting mathematics on a rigid axiomatic framework, and studying the results of such a framework. As such, it is home to Gödel's second incompleteness theorem, perhaps the most widely celebrated result in logic, which (informally) implies that there are always true theorems which cannot be proven. Modern logic is divided into recursion theory, model theory, and proof theory, and is closely linked to theoretical computer science. Discrete mathematics is the common name for the fields of mathematics most generally useful in theoretical computer science. This includes computability theory, computational complexity theory, and information theory. Computability theory examines the limitations of various theoretical models of the computer, including the most powerful known model - the Turing machine. Complexity theory is the study of tractability by computer; some problems, although theoretically soluble by computer, are so expensive in terms of time or space that solving them is likely to remain practically unfeasible, even with rapid advance of computer hardware. Finally, information theory is concerned with the amount of data that can be stored on a given medium, and hence concepts such as compression and entropy. As a relatively new field, discrete mathematics has a number of fundamental open problems. The most famous of these is the " P=NP?" problem, one of the Millennium Prize Problems. It is widely believed that the answer to this problem is no. Mathematical concepts and theorems need not correspond to anything in the physical world. Insofar as a correspondence does exist, while mathematicians and physicists may select axioms and postulates that seem reasonable and intuitive, it is not necessary for the basic assumptions within an axiomatic system to be true in an empirical or physical sense. Thus, while most systems of axioms are derived from our perceptions and experiments, they are not dependent on them. Nevertheless, mathematics remains extremely useful for solving real-world problems. This fact led Eugene Wigner to write an essay, The Unreasonable Effectiveness of Mathematics in the Natural Sciences.